​Look away, Alabama fans. The Crimson Tide nearly pulled off an upset against the No. 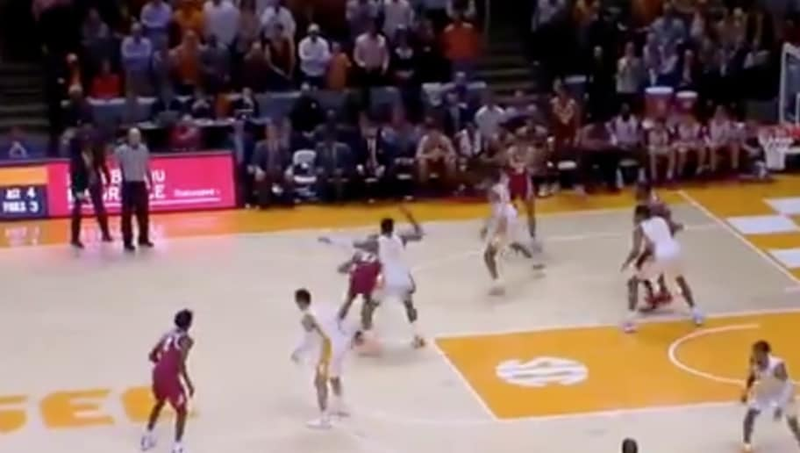 3 Tennessee Volunteers and ​Admiral Schofield, but that opportunity was taken out of their hands late, as officials made a questionable travel call against Bama in the waning seconds on the road. Of course it was on the road. Alabama guard John Petty had 30 points on the day and would've liked to cap his career game with one last bucket. Unfortunately, with the Tide down by a point, officials deemed Petty slid his pivot foot, even though the video challenges that opinion. Of course, even had the refs swallowed their whistle in Knoxville, there's no guarantee Alabama could've converted the possession into points in a hostile road environment. Nonetheless, it's an egregious call in the closing moments of a game which was poorly officiated from the outset. Wow. Alabama just got jobbed. Official called a really questionable travel in a one-point game against Tennessee with five seconds to play. Sheesh. Memo to refs: Let em play at game’s end unless it’s obvious! With the win, ​Rick Barnes and Co. advance their record to 5-0 in the SEC and have now won 12 straight games on the season. With one of more veteran squads in college basketball this year, anything other than a Final 4 appearance would be a disappointment in Knoxville.